Four species of dashers have been recorded in Arizona. One, the Blue Dasher, Pachydiplax longipennis, is generally common to abundant. 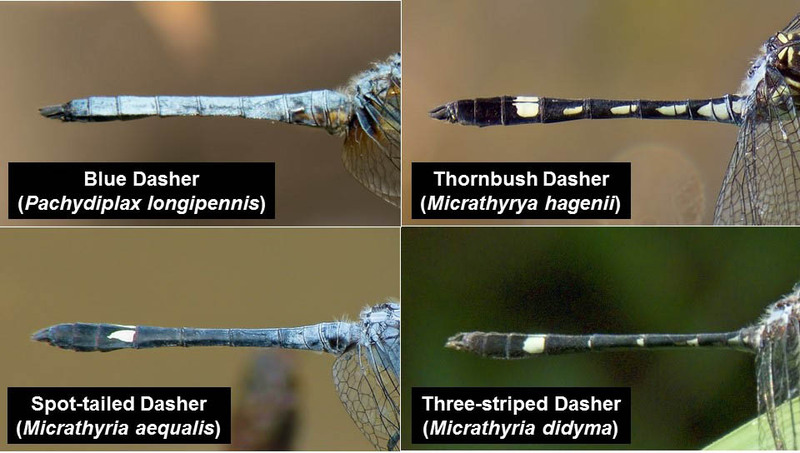 The other three species belong to the genus Micrathyria: Spot-tailed Dasher, M. aequalis, Thornbush Dasher, M. hagenii, and Three-striped Dasher, M. didyma. Micrathyria originate in subtropical regions, and are rare and not known to breed in Arizona. 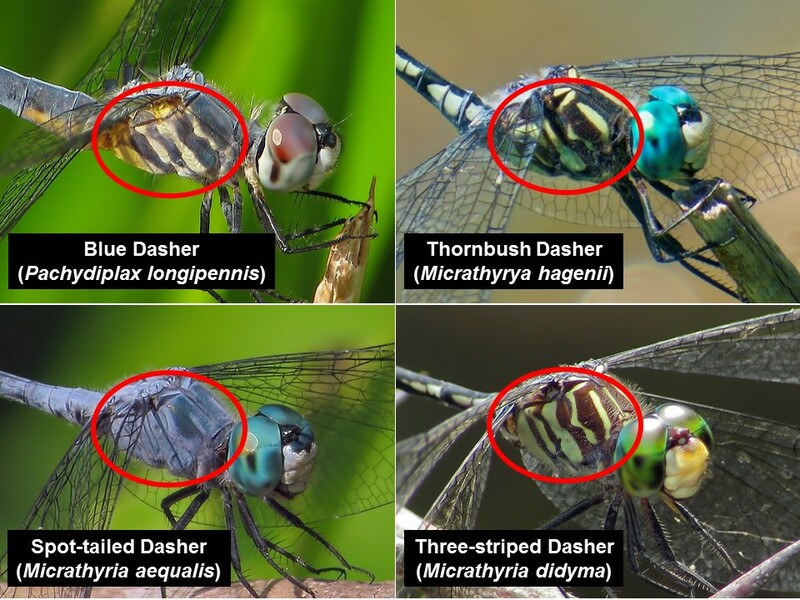 Blue Dasher differs from Micrathyria with regard to body size (see below) and to wing venation and color. Examination of the wing venation can be particularly important to separate female Pachydiplax from female Micrathyria. 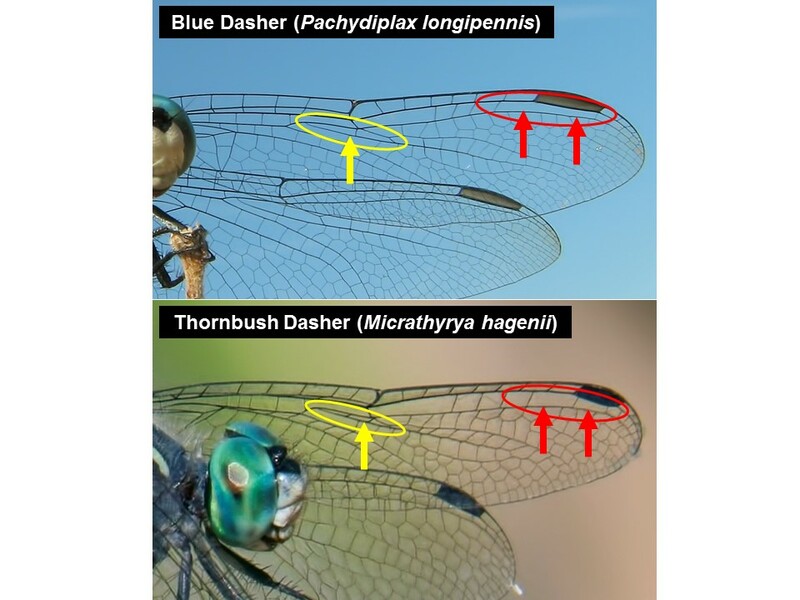 Comparison of the wing venation of Pachydiplax and Micrathyria. Three-striped Dasher: usually in the shade, often perches on vegetation above standing water. Small: Spot-tailed Dasher (30 mm). Blue Dasher: sides are evenly striped with yellow and dark brown. Note, however, that the thorax becomes pruinose blue with age, at which time stripes are no longer visible. Eye color also changes with age. Thornbush Dasher: sides unevenly striped with yellow and dark brown. Middle dark stripe is forked and so dark stripes form IYI pattern. Spot-tailed Dasher: Entire thorax pruinose blue. Three-striped Dasher: sides with yellow and dark brown stripes of uneven widths. Comparison of immature and mature male Blue Dashers illustrating age-related changes in eye and thorax color. Blue Dasher: pruinose blue, segments darker toward tip of abdomen. Thornbush Dasher: Black with relatively large white spots; large square spots on segment 7. Spot-tailed Dasher: pruinose blue with white pointed spots only on segment 7. Three-striped Dasher: black with small white spots; large spots only on segment 7. Side view of the abdomen of four dasher species.